As students, educators and parents we are in amazing times ... historians will look back at this age proclaiming that "Lifetime Learning" and "Mobile Learning" went through puberty and became a young adult ... for real this time. The technology is, of course, important as it made this transition possible (umm .. the metaphor is taking a strange turn here) ... and those same historians will agree that leading the revolution were Apple's mobile devices - the iPod Touch, the iPhone and the family of iPads. This is the reason that, in my eBooks, I've initially focussed on the iPad in teaching and learning - they are not offered as 'How-To" or "Instructional" manuals but to share some experiences in the hope that your own may be a little more informed. There is a free and open area on the Shambles.NET website that compliments the books - a dynamic, ever changing area that curates and offers the knowledge of many in the global educators community. Links to the books are below ... enjoy. 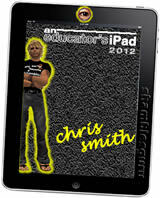 My first eBook published early in 2012 .. is written for educators and parents who have an interest in mobile learning and especially in the use of Apple's iPad tablet. An attempt to map Apple iOS Apps to Curriculum areas. Considering the rate of change in educational technology and pedagogy then I plan to update this each year. 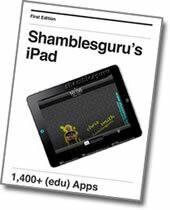 This ebook contains over 140 screenshots of the screens and folders on my own iPad, highlighting some of my favourite Apps. Each of the eleven Chapters, one per main screen, also includes a recorded audio commentary about why I've chosen some of these Apps and why I've organised them in the way I have. It is only available from the iTunes store and can only be read on Apple iOS devices ... the book was written using Apples iBooks Author in order to take advantage of the ability to embed multimedia. Note that the prices are not quoted here as they change depending on where you live and who the seller is. Both Amazon and Apple control the end price after authors give a recommended price ... my recommendations, you'll see, are very low ... I'll probably not be able to retire on this income but I will have, hopefully, a few nice bottles of wine and the satisfaction of sharing and making a small difference in the world ... enjoy. Technical Notes : if you buy from Apple's iTunes Store then the book can only be read on the iPad.... if you buy from Amazon it can be read on many different platforms not just the Kindle - including Apple devices ... download the Amazon Kindle App. Unfortunately ebooks and ibooks sold at both Apple and Amazon are not offered in every countrie's online store ... because of copyright and individual country regulations. Below is the interactive graphics from my workshop on "ebooks : what and how"